LT Auditor+ is supported by professional, knowledgeable staff who provide quick, clear, and decisive solutions to customer service issues. The staff is in place to provide assistance for issues not covered in the product manuals or on-line help screens. NO MACHINES – when you call Blue Lance, get live one on one support with our engineers directly. Blue Lance’s customer service is a team effort. Everyone from support, development, sales, operations, and management get involved. 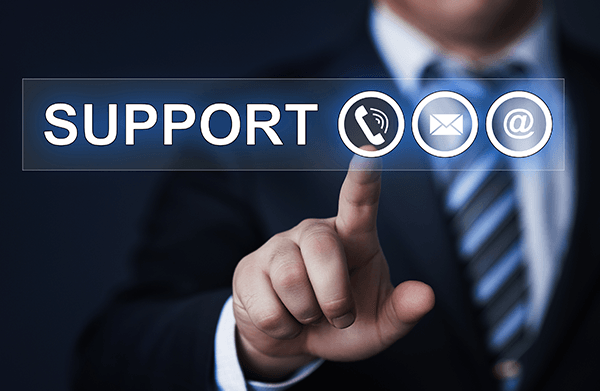 Our goal is to not only offer excellent support but also find solutions for your problem. Blue Lance strives to be available at every beck and call. We aim to give the best possible customer service experience. Updates and Patches are key components in keeping systems running at peak performance. These updates fix issues and also include new features, capabilities, and more efficient processes. Blue Lance has made it simple and easy to keep up to date, allowing you to stay focused on running your business. Added functionality to scan for computers in the directory and provide reports on when these computers were last accessed. Provided the capability to exclude ‘Builtin’ security principals to reduce the volume unnecessary data collected as well reduce the time to perform Assessment Scans. HF1307 boosts the reliability and resilience of LT Auditor+ as new monitoring and self-correcting capabilities have been added to ensure 24×7 uptime. This patch resolves problems with audit data not being correctly deleted from the LT Auditor+ Archive database. This issue impacts customers running all versions of LT Auditor+ 2013 on Microsoft SQL Server databases. This build supports auditing on OES 2015 NSS file systems and includes support for auditing CIFS access by Active Directory users. Blue Lance offers hands-on training options that will accelerate your learning, understanding and full use of our solutions. We offer one-on-one or group training either remotely or onsite. In addition, we offer customized training programs specifically tailored to your organization. Our goal is to increase productivity and operational efficiency of our customers by empowering them with the knowledge and skill needed to fully utilize our solutions in their unique environments.